You are looking at a Auto Ashtray & Cellphone Holder- a gadget which every responsible smoker should have in its car. As you imagine, the ashtray is located in the front, while in the back there is a holder for your cellphone, or pack of cigs, or bottle of water, or etc While it seems like a pretty normal product, imagine how useful it can be for the people that smoke and don' t have an ashtray in the car. A compact and multi-functional gadget which can be pulled and extended to save much room in the car. Constructed new material gives Drink Holder a solid structure and durable life. 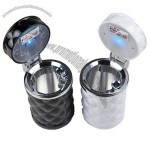 This Multi-functional Auto Ashtray is not only a cigarette ashtray and you can also put your small items such as cell phone,drink bottle in it. 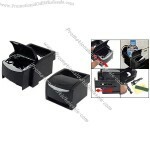 Fix the Car Ashtray in front of the car vent, keeping your drinks warm or cold. Easy installation. Open the package and insert the two clips into the slideway. 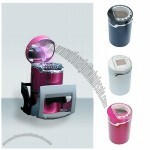 Finally attach it to the car vent with double-sided adhesive tapes. Next time you drive out, you can store your cigarette, drinks and other small things in the Cup Holder, flip cigarette ash in the Ashtray. 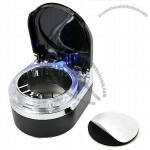 Plus, the ashtray can be covered with its flexible cap and take out the ashtray to empty and clean it for potential use. This one is used conveniently and suitable for any type motor. 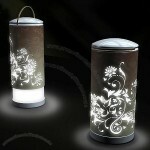 It is not only a practical ashtray, but also a pretty LED decorative lights. You can enjoy the unlimited fun of automobile and cigarette with this one. Can be placed on the dashboard of the car. The material of fire prevention. The tank can remove down to clean. When you open the cover, LED light will be on. 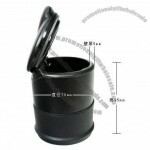 This car ashtray with luxury and practical design, it's safe and convenient to use. Ideal for office, home and car use. Equipped with snuffer hole and self-cleaning design. Absorb smoke by activated charcoal filter. 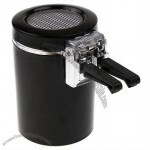 Custom-made Auto Ashtray From China Factory, Low price Auto Ashtray, Top Quality, True wholesale source for original!